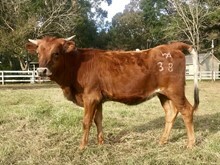 Henri is a beautiful Parker brown, straight Butler cow. She has incredible rolled back horn & is working on a tight twist like her dam. She raised an exceptional first heifer who has gone on to be shown. We have AI’d Henri back to Coach for a spring 2019 calf. We love her curious nature & sensible disposition.